Rembrandtplein is one of the busiest squares in the city, especially when it comes to nightlife and clubbing. It was originally a butter and dairy market, but changed over time. Rembrandtplein is named after the famous Dutch painter, Rembrandt van Rijn, creator of works such as the Night Watch. In the middle of the square you can find a large statue of the man gazing down on the late night party people. The oldest, still existing statue in Amsterdam is the “Rembrandt”. In 1852 the statue was realized on the square. One of the interesting things was that great artists were often used for statues, but a head of government or members of the royal family were not used often. In 1841 there was a plan to tribute to Rembrandt by a statue. Sculptor Louis Royer was commissioned, but execution was not without problems. Money was collected, but the value of it plummeted so that it was considered to put the statue in concrete. Fortunately the amount still was just enough to leave it in iron casting. The first casting failed, the second casting succeeded in 1851. The statue was molded in one piece, which was very special at that time. Therefore the name of the master caster, Ivar Jacobsen, was putted on the pedestal. However in 1924, the statue got a new pedestal and then Jacobsen was not visible anymore. On the 27th of May in 1852 Rembrandt was showdown and after that there was a big party with King Willem III. First it was placed at the northern part of the Buttermarket, but after that in 1876 the statue of Thorbecke was revealed and Rembrandt had to be moved. Since then he is stated in the middle of the Buttermarket, no known as Rembrandtplein. Rembrandt Harmenszoon van Rijn (16-06- 1669) was a painter and a etcher. He lived in the Golden Ages in the Netherlands, which was an era where Dutch culture, science economy and political influence reached a peak. The Sculptor, Louis Royer (1793-1868), was born in Mechelen, Belgium. In 1823 he won the Prix de Rome, which was a kind of scholarship for promising artists. Throughout this scholarship artists were able to go to Rome and follow a study. In the Kalverstraat you can find a church since the seventeenth century. This church was hidden in the garden of one of the houses until the nineteenth century. In 1853 the episcopal hierarchy was restored in the Netherlands, Catholicism was no longer forbidden and churches were built again. The architect who build the church, was Gerrit Moele. 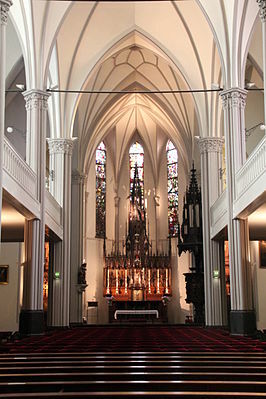 The church is one of the first neo- Gothic churches in a style that is also known as William II- style or plasterer Gothic. The portal on the Kalverstraat is striking, especially because it is very different from the many glass storefronts. In the front of the church it is decorated with a statue of St. Joseph and a concrete parrot on the other side. When you open the doors, you immediately will see the mosaics. These are made by Antoon Molkenboer (1872-1960). Every Sunday the church welcomes more and more foreign visitors and expats who may appreciate a Mass in their own language (or at least not in Dutch). Therefore the 12:15 hrs High Mass is celebrated in English. The songs will remain in Latin. Next Next post: Is Siesta being put to sleep?